Jeff Conant is International Forests Campaigner for Friends of the Earth-U.S. The whole concept fails to appreciate that it is industrial polluters in rich countries, not peasant farmers in poor countries, who most need to reduce their climate impacts. Her words are especially chilling because Teles de Carvalho Cunha is not just any rubber tapper – she is the president of the Rural Workers Union of Xapuri – the union made famous in Brazil when its founder, Chico Mendes, was murdered in 1988 for defending the forest against loggers and ranchers. Mendes’ gains have been consolidated in tens of thousands of hectares of ‘extractive reserves,’ where communities earn a living from harvesting natural rubber from the forest while keeping the trees standing. But new policies and programmes being established to conserve forests in Acre seem to be having perverse results that the iconic leader’s union is none too happy about. As Brazil has become a leader in fighting deforestation through a mix of public and private sector actions, Acre has become known for market-based climate policies such as Payment for Environmental Services (PES) and Reducing Emissions from Deforestation and Forest Degradation (REDD) schemes, that seek to harmonise economic development and environmental preservation. Over the past decade, Acre has put into place policies favouring sustainable rural production and taxes and credits to support rural livelihoods. In 2010, the state began implementing a system of forest conservation incentives that proponents say have “begun to pay off abundantly”. Especially as the United Nations Framework Convention on Climate Change continues to fail in its mission of bringing nations together around a binding emissions reduction target – the latest failure being COP20 in Lima earlier this month – REDD proponents highlight the value of “subnational” approaches to REDD based on agreements between states and provinces, rather than nations. The approach is best represented by an agreement between the states of California, Chiapas (Mexico), and Acre (Brazil). In 2010, California – the world’s eighth largest economy – signed an agreement with Acre, and Chiapas, whereby REDD and PES projects in the two tropical forest provinces would supply carbon offset credits to California to help the state’s polluters meet emission reduction targets. California policymakers have been meeting with officials from Acre, and from Chiapas, for several years, with hopes of making a partnership work, but the agreement has yet to attain the status of law. Attempts by the government of Chiapas to implement a version of REDD in 2011, shortly after the agreement with California was signed, met strong resistance in that famously rebellious Mexican state, leading organisations there to send a series of letters to CARB and California Governor Jerry Brown asking them to cease and desist. This view appears to be backed up now by a new report on the Green Economy from the Brazilian Platform for Human, Economic, Social, Cultural and Environmental Rights. The 26-page summary of a much larger set of findings to be published in 2015 describes Acre as a state suffering extreme inequality, deepened by a lack of information about green economy projects, which results in communities being coerced to accept “top-down” proposals as substitutes for a lack of public policies to address basic needs. Numerous testimonies taken in indigenous, peasant farmer and rubber-tapper communities show how private REDD projects and public PES projects have deepened territorial conflicts, affected communities’ ability to sustain their livelihoods, and violated international human rights conventions. The Earth Innovation Institute, a strong backer of REDD generally and of the Acre-Chiapas-California agreement specifically, has thoroughly documented Brazil’s deforestation success, and argues that existing incentives – farmers’ fear of losing access to markets or public finance or of being punished by green public policies – have been powerful motivators, but need to be accompanied by economic incentives that reward sustainable land-use. But the testimonies from Acre raise concerns that such economic incentives can deepen existing inequalities. The Bolsa Verde programme is a case in point: according to Teles de Carvalho Cunha, the payments are paltry, the enforcement criminalises already-impoverished peasants, and the whole concept fails to appreciate that it is industrial polluters in rich countries, not peasant farmers in poor countries, who most need to reduce their climate impacts. A related impact of purely economic incentives is to undermine traditional approaches to forest management and to alienate forest-dwellers from their traditional activities. Another indigenous leader from Acre, Ninawa Huni Kui of the Huni Kui Federation, appeared at the United Nations climate summit in Lima, Peru this month to explain his people’s opposition to REDD for having divided and co-opted indigenous leaders; preventing communities from practicing traditional livelihood activities; and violating the Huni Kui’s right to Free, Prior and Informed Consents as guaranteed by Convention 169 of the International Labor Organization. One of the REDD projects the report documents (also documented here) is the Purus Project, the first private environmental services incentive project registered with Acre’s Institute on Climate Change (Instituto de Mudanças Climáticas, IMC), in June 2012. 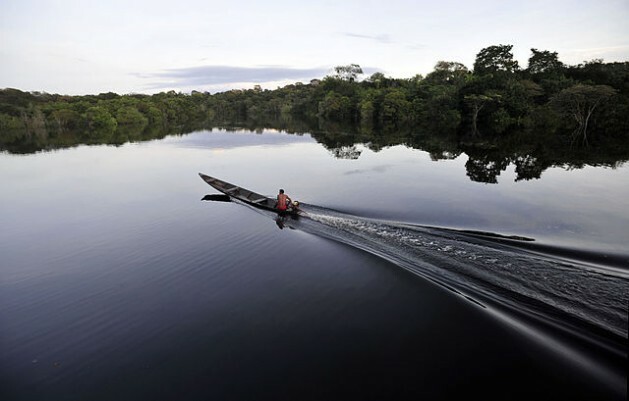 The project, designed to conserve 35,000 hectares of forest, is jointly run by the U.S.-based Carbonfund.org Foundation and a Brazilian company called Carbon Securities. The project is certified by the two leading REDD certifiers, the Verified Carbon Standard (VCS) and the Climate, Community, Biodiversity Standard (CCBS). The company’s apparent failure to leave a copy of the project contract with the community did not help to build trust. Like the Purus Project – and like many REDD projects in other parts of the world whose track record of social engagement is severely lacking – this project is also on the road to certification by VCS and CCB. Concerns like criminalising subsistence livelihoods and asserting private control over community forest resources, whether these resources be timber or CO2, is more than a misstep of a poorly implemented policy – it violates human rights conventions that Brazil has ratified, as well as national policies such as Brazil’s National Policy for the Sustainable Development of Traditional Peoples and Communities. The report’s conclusion sums up its findings: “In the territories they have historically occupied, forest peoples are excluded from decisions about their own future or—of even greater concern – they are considered obstacles to development and progress. As such, green economy policies can also be described as a way of integrating them into the dominant system of production and consumption.